Ceramic Braces Are Aesthetic Alternative To Metal Braces For Adults Who Don’t Want The Train-tracks and Metallic Look in Their Mouth. Ceramic braces are made of Monocrystalline or Polycrystalline Ceramic. 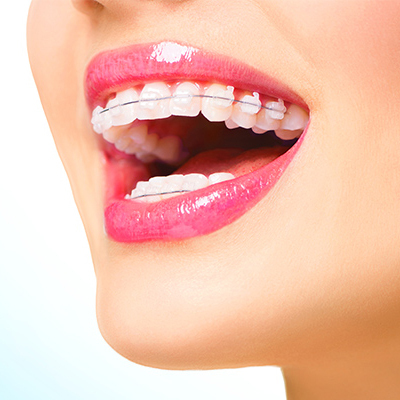 The main advantage of ceramic braces is that since they are translucent they can blend with the color of your teeth. Adult patients prefer them when they want to avoid a metallic smile in their mouth. The size and shape of Ceramic Braces is usually similar to the metal braces but their translucency and clear color makes them less noticeable. However, it has its own disadvantages due to the material which it is fabricated from. Ceramic braces are brittle and tend to fracture easily. Hence adequate care is necessary to prevent bracket fracture by avoiding heavy chewing force! Sometimes they tend to stain with certain foods. They are not truly “Invisible braces” and can still be seen in your mouth by your friends and family! Not all patients are ideal candidates for ceramic braces. These braces are stronger than the enamel of your teeth and are best avoided in deep bite cases. Inadvertent biting on ceramic bracket can result in enamel chips especially on the incisal edges of your upper anterior teeth. Research and clinical studies in the recent years have shown that they can cause microscopic enamel cracks during bracket debonding at the treatment completion. These cracks are very minor and difficult to notice. However, the pros and cons of ceramic braces must always be told to the patients by their orthodontist, to help them make an informed decision. If you are careful with your diet, you can choose the Ceramic Braces for your Orthodontic treatment. If it is difficult for you to avoid foods which can stain your ceramic braces, then your orthodontist might recommend a different kind of braces for your Orthodontic treatment.